A third straight win with a clean sheet will feed the hopes of Shamrock Rovers supporters that the club can end their wait for major honours, Stephen Bradley’s side four points clear at the top of the Premier Division table after a one-sided win over Sligo Rovers. But there was also food for thought for the onlookers in Tallaght Stadium from the Ireland management team, with senior boss Mick McCarthy, his assistants Terry Connor and Robbie Keane, and U-21 team manager Stephen Kenny all in attendance for this home success, sealed by goals from Dan Carr, Ronan Finn and Jack Byrne. It would have been worthwhile to overhear the FAI employees checking their notes after the game but they can only have been impressed by two men in particular, Hoops midfielder Byrne and his team-mate Trevor Clarke. Left-back Clarke has already earned an international call-up as he reports for U-21 duty next week, while Byrne had been in the senior squad under McCarthy’s predecessor but subsequently went off the radar. Still only 22, Byrne ran the show in midfield last night and his performance was capped off by a stunning goal on 81 minutes, and given McCarthy’s limited options in midfield, a call-up for Byrne is something that could not be ruled out in the medium term. 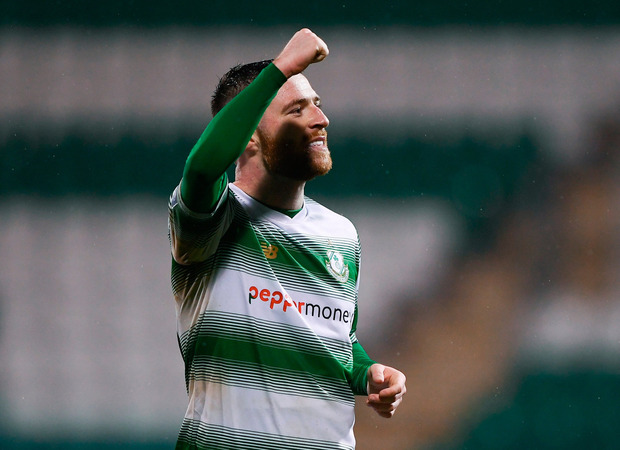 In the short term, all that counts for Shamrock Rovers is that their winning run, streak of clean sheets and status at the top of the table all remain intact, the Hoops able to go seven points clear if they can beat bottom side Finn Harps next weekend. Sligo came to Dublin on the back of a two-game winning run but before a ball was kicked, Liam Buckley understood that playing away to the league leaders would be a different world to knocking out wins over newly-promoted sides. That said, few expected how one-sided the game would be, Sligo simply unable to get out of their own half for long spells against an utterly superior Hoops side. Home supporters did need patience, though, as it took them until the 39th minute to get the breakthrough, but the outcome of a win for the Dublin club was never really in doubt. Six minutes from the break, Stephen Bradley’s side had the lead, at last, a corner from Byrne falling for Carr who tucked away his first goal of the season. It could have been 2-0 just after that, only for a fingertip save from Beeney to deny former Sligo player Greene. With Liam Kerrigan on as a half-time sub for the ineffective Romeo Parkes, Sligo had more bite about them but still lacked the nous needed to really trouble the home side. Rovers doubled the lead on 64 minutes, Finn the scorer but Byrne the creator as it was his ball which set up a chance for Greene and when the ball rebounded off a defender, it fell to Finn to score his first for the season. But Byrne was not finished and he popped up on 82 minutes, spotting ’keeper Beeney off his line and the former Manchester City player came up with a strike of skill and power to claim his first for the club, likely to be the first of many. SHAMROCK Rovers – Mannus; O’Brien, Lopes, Grace, Clarke; Bolger; Byrne, McEneff, Finn (Watts 67), Carr (Coustrain 80); Greene (S Kavanagh 68). SLIGO Rovers – Beeney; Morohan, Callan-McFadden, Mahon, Banks; Dunleavy; Twardek, Cawley (Warde 78), Parkes (Kerrigan 46); Murray (Fordyce 78); Coughlan.